Made-to-order shirts and blouses allow you to have the design you want without having to settle with only available in the marketplace. Are you looking for a longer collar? A three-quarter sleeve shirt? A specific colour? Whatever it is that you need, we can most likely help to create it for you! One of the strengths of our company is the manufacture of shirts and blouses for company uniform which meet your specification. Perhaps you want particular colours, pantone matched, a certain type of fabric, a style suitable for your work environment, special fastenings, or even engraved buttons. We can manufacture to all of the above specifications! Our attention to detail ensures that your order of shirts and blouses are manufactured to a high standard and deadlines are met. We manufacture both in the UK and India. If you require the garments to be embroidered or printed with your logo we can supply this as part of your order during the manufacturing process. We can weave fabric especially for you. For example you may want fibre content specific to your industry, the fabric to match a pantone colour, or you might require check fabric to match your organisations colours. We can help you with all of these needs! Our usual minimum order is 500 shirts or blouses per style and colour. However if you require less than this please ask and we will do our best to help. Whether it's a classic style collar, a razzle dazzle style, button down style or rounded, we can manufacture the design for you. You give us your ideas and we will do the rest! We have hundreds of patterns we can adapt for you. Whether you want one button, mother of pearl buttons, engraved buttons. fold back, piped, contrast or other styles! 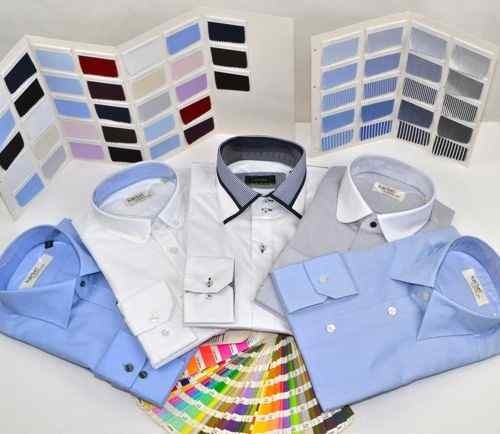 Do you need company shirt and blouses manufactured in a particular fabric. For example organic fabric, cool fit fabric, 100% cotton, anti-static fabric, 80-degree washable fabric, or ethically certified fabric? We can meet a huge range of requirements you might have. Call us today to find out more! We can manufacture shirts and blouses to a high standard both here in the UK and in India.